Built by John Brier, then owner of Oak Bank Mill, this large house was constructed in 1858, overlooking the mill. 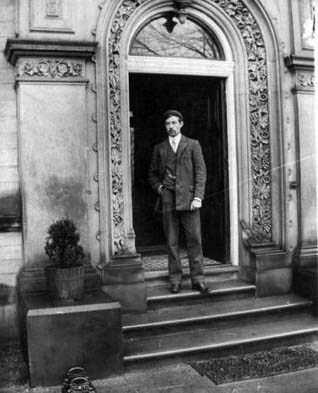 His development included a lodge cottage at the end of the drive where it adjoins Shrigley Road, a coach house used for stabling of horses and garaging of the carriage, and landscaped gardens which included a large number of trees, rockery around the edges of the original quarry, and a summer house on top of the hill above Beeston quarry with a path up the hill to reach it. The main drive from Shrigley Road passed along the lower garden before turning up to the front door (picture below). Much of this drive is today burried beneath the gardens of the present houses. Today’s Oak Bank Drive is largely the original access to the coach house and the tradesmans’ entrance to what was the back of the original house. The site of this house was originally a quarry, part of Beeston quarry, cut into the hillside. In order to provide an adequate and private location, Brier built a huge terrace wall around the lower side of the site. This extends for several hundred feet in length and varies in height up to 16 feet high. At some points there was a rake of two or even three terrace walls, one above the other up the hillside. A flight of steps provided access down to the the back of the mill. All of these features remain today. The house was built of local stone. Regrettably, we don’t have a picture of the full house, but a few pictures showing just small corners, such as that including the front door (left) and the side and garden (below). However, that is enough to show that this was a sumptuous mansion. The front door frame was particularly elaborate surrounded by a beautiful stone frieze. Dr John Coope believed that this might well have been carved by the Kerridge sculptor, Alfred Gatley. 1861: John Brier from Manchester lived here aged forty nine, described as Calico Printers and Manufacturers employing 200. His Yorkshire born wife Elizabeth was thirty six years old. 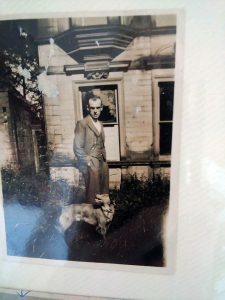 He had five sons and one daughter at this point aged between 1 year and nineteen years all born in Bollington except the eldest who was born in Rainow. They had three servants one was from South Africa`s Cape of Hope ! 1871: John and Elizabeth are still at Oak Bank House with their children although two are not mentioned and there are two new ones aged six and nine years old. The two oldest boys are a Cotton Spinner and a Cotton Printer. 1892 Mrs Brier lived at Oak Bank according to Kelly`s Directory. 1896 Kelly`s Directory and the 1901 census, James A Wilson aged 58 lived at Oak Bank, he was a Calico printer. Also living there was his daughter Emily aged 19 and son James aged 18, with one servant. There is thought to have been a fire in 1905 which damaged part of the house. The undamaged part remained in occupancy until about 1930 when it was abandoned. 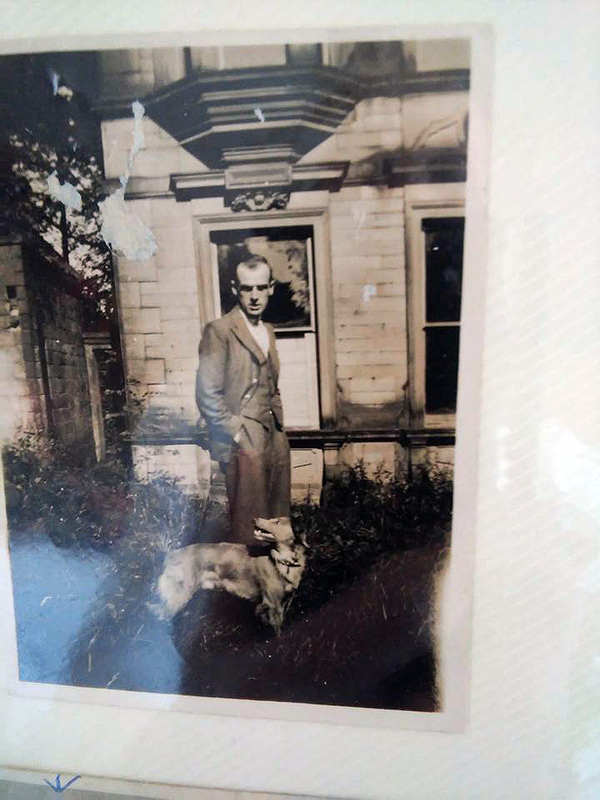 Harold Gould above at Oak Bank House around 1930, he lived down the lane at Oak Bank Lodge. Above the gardener at Oak Bank House. Local children played on the site for many years after and regarded the partly roofless building as very spooky! The local scouts used the separate coach house as their scout hut. There were huge greenhouses on the bank above the house, complete with a boiler house to provide heating. At some point around the end of WWII the house was demolished and most of the stone was removed from the site. The flat ground including where the house had stood was then concreted over and the whole site including the lower gardens was used to stockpile coal. At some point the last of the coal was removed and the site closed up. Nature took over and very large numbers of sycamore trees grew over the site and among the surviving original trees. In 1983/84 the site was opened up and four detached houses were built around the edge of the concrete slab. This slab was later broken up but not removed. It was covered with soil for front lawns and driveways to the houses. As an occupier of one of these houses I (Tim Boddington) can tell you that, besides the fantastic view across the village, there are two notable aspects of the site’s past – my garden was covered in nutty slack, and I continue, even after 30+ years living there, to find shards of glass, particularly around where the greenhouses were! Unsure who this lady is, any help appreciated. I haven’t seen the picture from Gardening Illustrated. 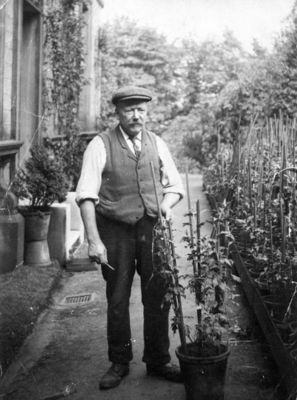 If he was so interested in photography, what a pity that we don’t have a collection of pictures of the house and its garden, not to mention pictures of the rest of Bollington.